['not all of those who wander are lost']. Spaziergangwissenschaft [ An everyday practice]. Stefaan Van Biesen is a Belgian visual artist, multimedia artist, sound artist and writer. His oeuvre is focused on the research of walking as an instrument of knowledge and of artistic creation. An artistic trajectory of more then 20 years consists out of walks, drawings, projects, installations, videos, perfomances, texts and soundscapes, developed as an interactive process, a stream of ideas, images, sounds and visions in which collaborations with other artists, experts from various disciplines and community based artistic processes are important components. Since 1990 Stefaan van Biesen undertakes, at home and abroad, walks, which, by way of performance, he documents with video, pictures, models, texts, drawings. The Swiss sociologist and urbanist, Lucius Burckhardt [1925-2003] introduced in the nineties the concept: 'Spaziergangwissenschaft'. Stefaan van Biesen wanted to expand this 'science of walking'. 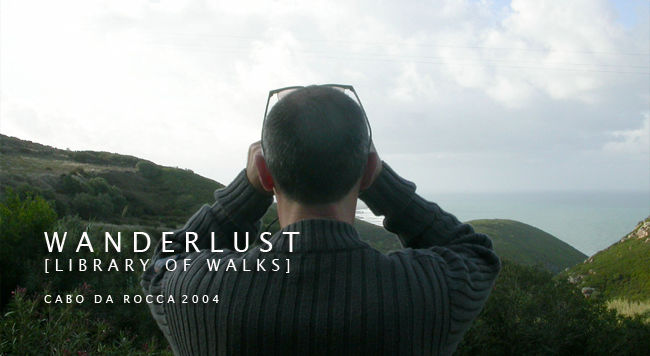 It can be seen as a subjective thought exercise in the urban texture and the landscape, ['Head Wanderer' 2002]. This resulted in 'Sensitive islands' where social observations from an unbiased position were recorded. Thus arose in various libraries 'Libraries of the Walks' [the most recent was seen in Brasilia 2012, [Jardim Botanico, Brazil]. The core remains a question, an invitation to the 'art of wandering', where the destination is secondary to the road itself. The day as a cycle of meetings, the body as a moving center, instrument of knowledge, experience and creativity. 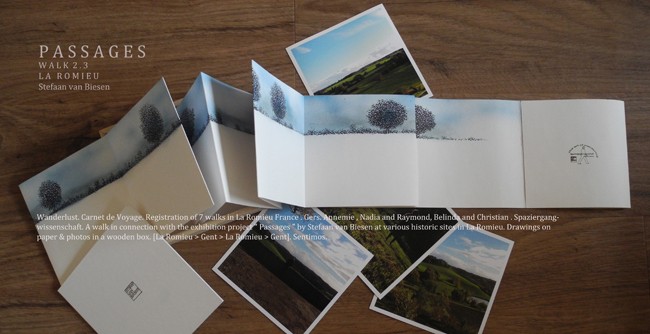 Stefaan van Biesen plays an important role in this 'science of walking': he examines it in an aesthetic way, documented with installations, performances, multimedia, drawings. His work has a strong affinity with the work of another famous 'walker': Fernando Pessoa. Van Biesen's thinking is in line with the nomadic aspect of the Renaissance artists who traveled all over Europe. Dürer is a striking example of this. These journeys were art projects, in which currents of thoughts, drawings and other artifacts arose out of encounters with other people and cultures. These trips were, as it were, laboratories of thought. Van Biesen shows this lab. Notes, artifacts and drawings upholster his journey. Walks are traces of memory, as an ecological gesture, an invitation to wander. 1992 > the first registrated walk. 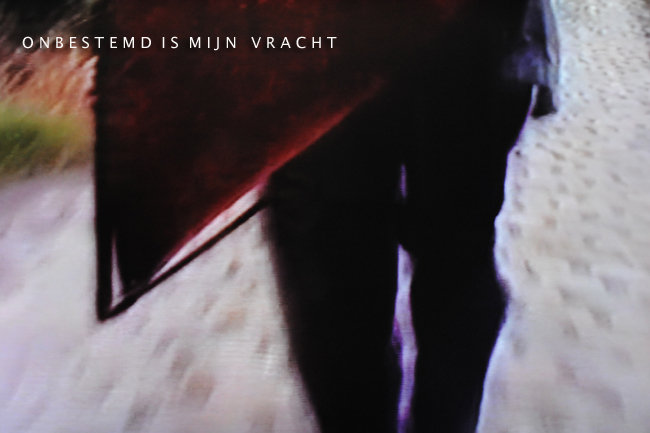 [My load is undefined/ Onbestemd is mijn vracht] [video 1992]. The registration of a 2 days walk. A walking performance on several locations in Flanders Belgium. Video/production made by my fellow walker: Toon Sarens. [My load is undefined] My first walk as the start of an artistic practice: registration of a two days walk in the Flemish landscape: Melsele Belgium 1992. Attribute Stefaan van Biesen. An homage to Breugel and Bosch. Camera and video by Toon Saerens. Time 04:46. Method I: broadly documented walks > research in the urban human space > walks as a sensory experience > which through documentation have a scientific and aesthetic layer. In 2005 Ingrid Pee (former assitant of Joseph Beuys during the 7000 Oak project in Kassel Documenta Germany) introduced us to the concept of 'Spaziergangwissenschaft', which was introduced in the 1990s at the University of Kassel, Germany, by the Swiss sociologist and urbanologist Lucius Burckhardt (1925-2003). Walking elevated to an observing stimulus in relation to space. It perfectly matched my work and thinking. It was a revelation and it gave a nice feeling to see that my work fit in with an artistic tradition, a large family of predecessors. Method II: between 2000 and 2004 > members of 'Bewust Wandelen' [Walking Consciously] > the concept of geomancy > a small alternative group of artists, writers and therapists, under the inspired wings of Kris Tolomei, who regularly organized lectures and walks at energetic places in Belgium and Holland. Photo: Annemie Mestdagh during a sensorial walk in the Zoniënwoud near Brussels with a large group organized by Joel Libert. During this period, a cross-pollination has become the foundation of the work of Stefaan van Biesen: an urban flaneur that allows art to emerge from observation. Life as a cycle of encounters with people, situations, places, buildings, the natural and animal world, a conversation with trees since childhood days. A rich breeding ground as an artist. Axis Mundi. During the walks we embraced trees. 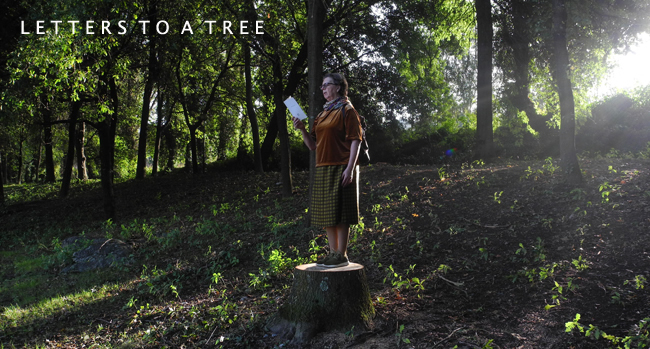 We also stood on the remains of shopped off trees as an ecological comment, a small natural 'speakers stage' > so holding a speech or reading a letter. Trying to imagine how the tree looked like when he was whole. To be aware, trying to feel and to become the tree, imagine his presence and energy. 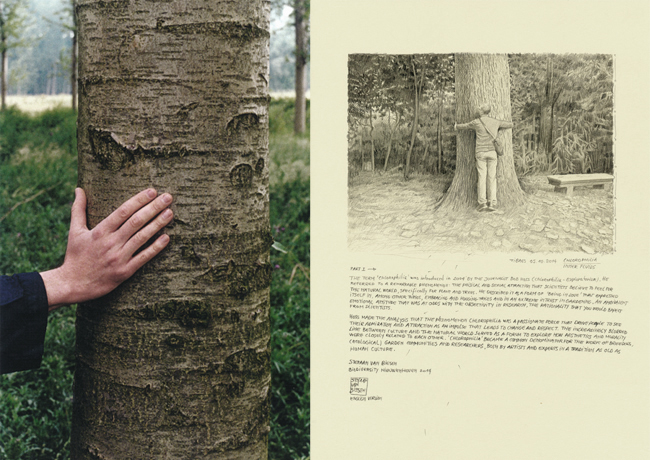 Photo: embracing trees. 'In the work of Stefaan van Biesen an associative solidity has arisen between thinking, acting, environment and well-being. Formulated as a question: 'how do our thoughts manifest themselves via acts in our environment and to what extent do they contribute to our well-being?' (Stef Van Bellingen, 2006). The body is experienced as an influential instrument, a subject that feels out its environment and resonates out of a sensitive thinking. The body thus moves in an optical and emotional field out of a panoramic perspective, a sanctuary. 'The flaneur walks in the city's hustle and bustle as a devoted observer, who with great excitement absorbs everything in order to try to understand life and to wonder. In the midst of all urban activity he solves and becomes one with the city he has become. Modern cities have often forgotten how to listen to walking and the needs of people who are walking. With a focus on two questions, interspersed with short walks. How can the ideas of listening to walking and listening while walking be brought into the day-to-day worlds of city planning and design? How can the worlds of art and walking advocacy work together to help communities get the mix of physical and spiritual walking space that they need to make healthier and happier places? Walking is low impact, requires minimal equipment, can be done at any time of day and can be performed at your own pace. You can get out and walk without worrying about the risks associated with some more vigorous forms of exercise. Walking is also a great form of physical activity for people who are overweight, elderly, or who haven’t exercised in a long time. Walking is sociable, improving our sense of community. 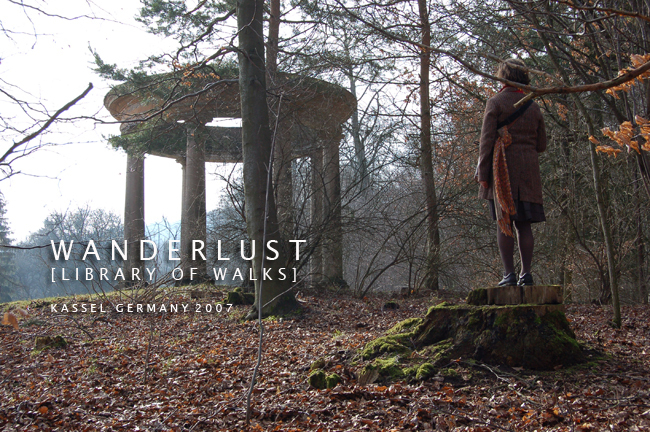 Wanderlust > a tribute to previous walkers. Walking Talking interview by Andrew Stuck [Museum of Walking London UK] 2019. [Talking Walking] Made of Walking ⋈ La Romieu France 27.08 > 01.09.2017. Wanderlust. An hommage to Caspar David Friedrich. [1774-1840]. Letter: Thoughts of a coincidental walker (in a city park). 'The black bird above me knows that the evening is falling. It croaks its dissatisfaction and then flies away, far from the place where I stand. It is like a little rascal who tries to chase me away. I know it is there, hidden between the foliage, waiting for me to leave. It sees me as an uninvited guest in its sunroom and claims this spot. A soft tangle of countless weak noises makes it clear that I am not alone on this path. I am a walker with an inward turned ear, listening to the beat of my heart, and to how my lungs fill up with air and release it after every breath I take. A body that sways like a feather, a vibrating string in a big sound box named world. A strange kind of music appears out of nothingness. It sounds like humming, the buzzing of a dancing bee in its hive. The throat, a shaft of noises, through which everything has to be shoved. And it fades away through the thin layers of air around me. Words, which dissolve into nothingness, thoughts which keep spinning around in your head. Documenting walks over the years.